Social platforms like Twitter are amazing for engaging users and cultivating new and loyal customers. But they have that one nagging issue: It’s clear that they own their users, not you. Even if you have a dedicated follower base, you still need to use their platform - and spend a bit on their advertising products - to reach them. So what can you do to own your Followers? Capture their email address using lead generating tactics. Studies like the March 2013 Epsilon survey show that emails get read, opened and clicked on. It also shows that triggered messages (emails sent to subscribers based on specific events, such as sales, birthdays and more) have proven success, and are on the rise. According to emarketer, however, B2C and B2B lead generation remain the number one challenge for marketers in 2013. As it happens, used smartly, Twitter can be an incredible tool to get more emails from your prospective leads. A simple trick to getting more leads is creating a call to action in your business Twitter bio. Many businesses don’t think to do this. Your Twitter bio is what your followers see when they visit your account. It doesn’t change (unless you edit it). This gives you 160 characters to tell your followers about your business. It’s also a great opportunity to promote consumer related email-gated content. Don’t squander it! Make a clickable link, with a simple call to action, in your Twitter bio. Put the link right in your bio (highlighted in red below) not the website link below it. Make it click through to an email-gated landing page on your website. What does email-gated content mean, you ask? It’s simply content (like an eBook, a newsletter sign up, a webinar, or an infographic) that can only be accessed by giving an email in exchange. As you can see in this example, Wishpond has a clickable link to our collection of eBooks. The eBooks are free, and email-gated. It’s best not to use a bitly, or a shortened twitter link in this case. Spell out the landing page you want your followers to click through to. This just makes it a bit more friendly. And it doesn’t hurt your brand recognition either. Be sure the link is to a specific email-gated page or pages on your website. You’d be surprised at how this easy little tweak to your bio gets you more email leads. There are added benefits to making these updates to your Twitter bio. If you use Twitter to sign into other social sites, like Mashable, Klout for Business or pretty much any site, your Twitter bio shows up too. Make the most of this, with clear CTA’s to email-gated content on your website. Like your Twitter bio, your Twitter background provides an excellent opportunity to add CTA’s to email-gated content. 2. Be clear about what you are giving in exchange for an email - whether that is a webinar, ebook, or discount. 3. Choose an image that gives impact to your product. If you are giving away a free ebook, include the cover of the book on your Twitter background. 4. Choose colours that stand out. If your Twitter background colour is, say, blue, make your CTA image orange, or white. They use a bitly link that takes you to the ebook landing page. Note: I would suggest spelling out your website url, with the landing page. It makes you look a bit more friendly (using your name), and helps your brand recognition - but bitly links can help you shorten and track. Freetwitterdesigner.com/ has a great (and free!) application that makes it easy to create a Twitter Desktop Background, for those without Photoshop skills. Take the opportunity to send out periodic tweets about your own email-gated content on your website. You might have a landing page for your e-newsletter subscription page. Tweet this out. Or, you might have other email-gated content like eBooks, webinars or infographics. Tweet this out to your followers. In this example, Wishpond tweeted about a free eBook on Twitter Content Marketing. The link directs followers to a distinct landing page on our site, where you can download our eBook in exchange for your email. You don’t always need to have a fresh piece of content to use this tactic. You can re-use the same gated content page regularly. This can be done by tweeting bite-sized tidbits from different sections of the piece to appeal to different followers. In addition to tweeting email-gated content, use Twitter ads to advertise your content to targeted potential followers. I’d suggest using the Promoted Tweet option, as this advertises your specified tweet. If you haven’t used Twitter Ads, you’ve likely at least seen them. They stream in targeted Twitter feeds. The example above shows a Promoted Tweet from a business that’s followed by people I follow. These ads aren’t quite as fine-tuned or in-depth as Facebook in reaching your market, but they do get your message out to your niche. Use a Promoted Tweet with an interesting “ask”, and link it to your email-gated content on your website. You can go to ads.twitter.com to create Promoted Tweets for your Twitter account. Check out our recent ebook “ A Simple Guide to the New Twitter Ads” for an in-depth walkthrough on using Twitter Ads for your business. An enter-to-win sweepstakes is an easy way to engage people and convert them into email signups by enticing them with a prize. The thrill of a win can generate excitement around your brand, particularly if the prize resonates with your consumer. Diamond Candles, for example, uses Twitter Sweepstakes to generate excitement about their product, and grow their email list. 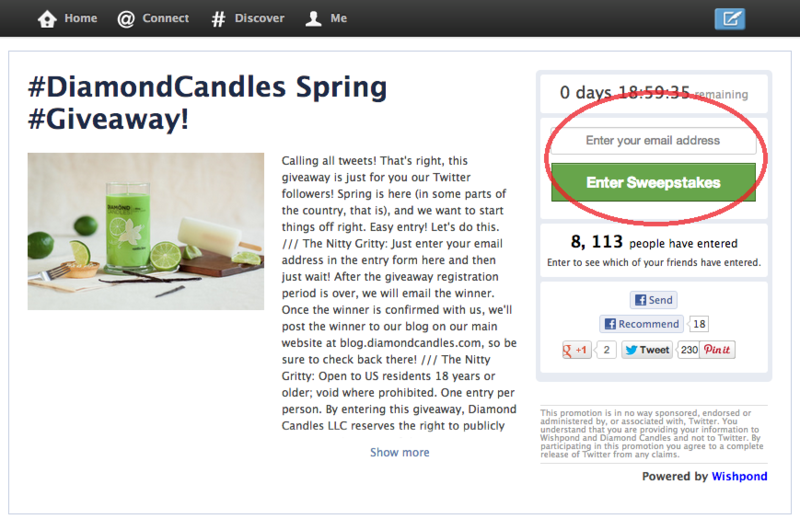 The Diamond Candles TwitterSpring Giveaway was a crazy (kind of mind-boggling) success. In just two days they generated over 8,000 entrants - a huge win for a small business that sells candles. How else could you get so many email leads? Using Wishpond they were able to automatically compile these emails into a list that could be downloaded to an excel spreadsheet or directly to Mailchimp (a Wishpond Integration Partner). How does a Wishpond-powered Twitter Sweepstakes work? For each Twitter contest Wishpond creates a unique page with the look and feel of Twitter and the businesses Desktop Background from their Twitter Account. Businesses can even have users enter the contest by connecting with their own Twitter Account. This allows the application to post a Tweet on the users feed about the contest, with a link back that their followers can click to enter the sweepstakes. 3rd party apps like Wishpond’s include built-in voting and entry forms that require users to give you their email address - and even connect with their Twitter account - to enter. With a user-generated content contest, your entrants have already taken a psychological step in interacting with you and getting closer to your brand. You have their emails. Use the connection to market your brand. You could, for example, use this opportunity to send out a thank you email to every entrant - regardless if they win or not - and give them a discount at your store. Again, notice the look and feel of being on Twitter. This makes your Twitter contests more friendly for your followers. If you’re skimming and you skipped it - check out “5. Enter-to-win Sweepstakes on Twitter” to see how contest apps like these work on Twitter. Check out this example from Priceline (one of the first test big brands). They’re offering a coupon for a hotel stay. When a user signs up a coupon code is emailed to them. They’ve been rolling it out with a few big brand customers, and it’s now available to managed clients. According to the Twitter advertising blog, it will soon be available to small and mid-size businesses. It’s not clear if Twitter will allow businesses to keep the email addresses that users submit to sign up for the coupons in LGCs. But I’m thinking they will follow Facebook’s lead with Facebook Offers in that they will not. This will force businesses to continue using Twitter to reach their followers, as opposed to being able to reach them through email. This will leave 3rd party applications like Wishpond’s Twitter Contest and Promotions Apps with a clear advantage in their ability to capture user’s contact information. As a marketer I’m excited for Twitter to keep expanding their marketer toolset. Right now the platform is at somewhat of a disadvantage to Facebook - especially with the Facebook Page Tabs that make it easy to add lead generating applications, forms and landing pages - so I spend most of my time (and ad spend) on FB. But as Twitter opens up I’ll be ready to see how it can boost the ROI for my clients and me. So there you have it: now you know more on how to generate leads. By making a few tweaks and additions to your social media strategies, you can harness the power of Twitter to increase the power of your email leads and improve your B2C and B2B lead generation. What do you think? Do you use Twitter tweaks to enhance your email lead generation? What successes have you had?